Each year, there are a lot of university graduation speeches circulating on the internet. I thought I would start the graduation season off early and send you the best one from last year. This speech was GREAT. The link below is to the video of a speech given by the Admiral of the Navy Seals. He spoke to the University of Texas—–I guarantee that this is worth your twenty minutes. AND you will learn something valuable from it. Below the link is an article from the Wall Street Journal on the same speech. I think the video is better, but you have a choice. What drives your choices? What motivates you to be successful, to achieve your goals? The answer: your values. When you live by a code of values, each decision you make and action you take reflects those beliefs. By holding true to the values that matter to you, your path in life will become much clearer. Adm. William H. McRaven, commander of U.S. Special Operations Command, gave a commencement address last week that graduates, and their parents, won’t soon forget. The following is adapted from the commencement address by Adm. William H. McRaven, ninth commander of U.S. Special Operations Command, at the University of Texas at Austin on May 17, 2014. I have to admit—I kinda like it. Tonight there are almost 8,000 students graduating from UT. That great paragon of analytical rigor, Ask.Com, says that the average American will meet 10,000 people in their lifetime. That’s a lot of folks. But if every one of you changed the lives of just 10 people, and each one of those folks changed the lives of another 10 people—just 10—then in five generations, 125 years, the class of 2014 will have changed the lives of 800 million people. Eight-hundred million people—think of it: over twice the population of the United States. Go one more generation and you can change the entire population of the world—eight billion people. If you think it’s hard to change the lives of 10 people, change their lives forever, you’re wrong. I saw it happen every day in Iraq and Afghanistan. A young Army officer makes a decision to go left instead of right down a road in Baghdad and the 10 soldiers with him are saved from close-in ambush. In Kandahar province, Afghanistan, a noncommissioned officer from the Female Engagement Team senses something isn’t right and directs the infantry platoon away from a 500-pound IED, saving the lives of a dozen soldiers. 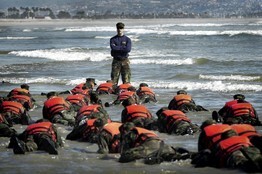 A Navy SEAL instructor and his class during ‘Hell Week’ in Coronado, Calif. But, if you think about it, not only were these soldiers saved by the decisions of one person, but their children yet unborn were also saved. And their children’s children were saved. Generations were saved by one decision, by one person. But changing the world can happen anywhere and anyone can do it. So, what starts here can indeed change the world, but the question is: What will the world look like after you change it? Well, I am confident that it will look much, much better, but if you will humor this old sailor for just a moment, I have a few suggestions that may help you on your way to a better a world. And while these lessons were learned during my time in the military, I can assure you that it matters not whether you ever served a day in uniform. It matters not your gender, your ethnic or religious background, your orientation, or your social status. Our struggles in this world are similar and the lessons to overcome those struggles and to move forward—changing ourselves and the world around us—will apply equally to all. I have been a Navy SEAL for 36 years. But it all began when I left UT for Basic SEAL training in Coronado, Calif. Basic SEAL training is six months of long, torturous runs in the soft sand, midnight swims in the cold water off San Diego, obstacle courses, unending calisthenics, days without sleep and always being cold, wet and miserable. It is six months of being constantly harassed by professionally trained warriors who seek to find the weak of mind and body and eliminate them from ever becoming a Navy SEAL. So, here are lessons I learned from basic SEAL training that hopefully will be of value to you as you move forward in life. 1. Every morning in basic SEAL training, my instructors, who at the time were all Vietnam veterans, would show up in my barracks room and the first thing they would inspect was your bed. If you did it right, the corners would be square, the covers pulled tight, the pillow centered just under the headboard and the extra blanket folded neatly at the foot of the rack—that’s Navy talk for bed. It was a simple task, mundane at best. But every morning we were required to make our bed to perfection. It seemed a little ridiculous at the time, particularly in light of the fact that were aspiring to be real warriors, tough battle hardened SEALs, but the wisdom of this simple act has been proven to me many times over. If you make your bed every morning you will have accomplished the first task of the day. It will give you a small sense of pride and it will encourage you to do another task and another and another. By the end of the day, that one task completed will have turned into many tasks completed. Making your bed will also reinforce the fact that little things in life matter. And if by chance you have a miserable day, you will come home to a bed that is made—that you made—and a made bed gives you encouragement that tomorrow will be better. 2. During SEAL training the students are broken down into boat crews. Each crew is seven students—three on each side of a small rubber boat and one coxswain to help guide the dingy. Every day, your boat crew forms up on the beach and is instructed to get through the surfzone and paddle several miles down the coast. In the winter, the surf off San Diego can get to be 8 to 10 feet high and it is exceedingly difficult to paddle through the plunging surf unless everyone digs in. Every paddle must be synchronized to the stroke count of the coxswain. Everyone must exert equal effort or the boat will turn against the wave and be unceremoniously tossed back on the beach. For the boat to make it to its destination, everyone must paddle. You can’t change the world alone—you will need some help—and to truly get from your starting point to your destination takes friends, colleagues, the goodwill of strangers and a strong coxswain to guide them. 3. Over a few weeks of difficult training my SEAL class, which started with 150 men, was down to just 42. There were now six boat crews of seven men each. I was in the boat with the tall guys, but the best boat crew we had was made up of the little guys—the munchkin crew we called them. No one was over about 5-foot-5. The munchkin boat crew had one American Indian, one African-American, one Polish-American, one Greek-American, one Italian-American and two tough kids from the Midwest. They out-paddled, out-ran and out-swam all the other boat crews. The big men in the other boat crews would always make good-natured fun of the tiny little flippers the munchkins put on their tiny little feet prior to every swim. But somehow these little guys, from every corner of the nation and the world, always had the last laugh—swimming faster than everyone and reaching the shore long before the rest of us. If you want to change the world, measure people by the size of their heart, not the size of their flippers. 4. Several times a week, the instructors would line up the class and do a uniform inspection. It was exceptionally thorough. Your hat had to be perfectly starched, your uniform immaculately pressed and your belt buckle shiny and void of any smudges. But it seemed that no matter how much effort you put into starching your hat, or pressing your uniform or polishing your belt buckle, it just wasn’t good enough. The instructors would find “something” wrong. For failing the uniform inspection, the student had to run, fully clothed, into the surfzone and then, wet from head to toe, roll around on the beach until every part of your body was covered with sand. The effect was known as a “sugar cookie.” You stayed in that uniform the rest of the day—cold, wet and sandy. There were many students who just couldn’t accept the fact that all their effort was in vain. That no matter how hard they tried to get the uniform right, it was unappreciated. Those students didn’t make it through training. Those students didn’t understand the purpose of the drill. You were never going to succeed. You were never going to have a perfect uniform. Sometimes, no matter how well you prepare or how well you perform, you still end up as a sugar cookie. It’s just the way life is sometimes. If you want to change the world, get over being a sugar cookie and keep moving forward. 5. Every day during training you were challenged with multiple physical events. Long runs, long swims, obstacle courses, hours of calisthenics—something designed to test your mettle. A circus was two hours of additional calisthenics designed to wear you down, to break your spirit, to force you to quit. No one wanted a circus. A circus meant that for that day you didn’t measure up. A circus meant more fatigue, and more fatigue meant that the following day would be more difficult—and more circuses were likely. But at some time during SEAL training, everyone—everyone—made the circus list. Yet an interesting thing happened to those who were constantly on the list. Over time those students, who did two hours of extra calisthenics, got stronger and stronger. The pain of the circuses built inner strength—built physical resiliency. But if you want to change the world, don’t be afraid of the circuses. 6. At least twice a week, the trainees were required to run the obstacle course. The obstacle course contained 25 obstacles including a 10-foot-high wall, a 30-foot cargo net and a barbed-wire crawl, to name a few. But the most challenging obstacle was the slide for life. It had a three-level, 30-foot tower at one end and a one-level tower at the other. In between was a 200-foot-long rope. You had to climb the three-tiered tower and, once at the top, you grabbed the rope, swung underneath the rope and pulled yourself hand over hand until you got to the other end. The record for the obstacle course had stood for years when my class began training in 1977. The record seemed unbeatable until one day a student decided to go down the slide for life—head-first. Instead of swinging his body underneath the rope and inching his way down, he bravely mounted the top of the rope and thrust himself forward. It was a dangerous move—seemingly foolish, and fraught with risk. Failure could mean injury and being dropped from the training. Without hesitation, the student slid down the rope, perilously fast. Instead of several minutes, it only took him half that time and by the end of the course he had broken the record. If you want to change the world sometimes you have to slide down the obstacle head-first. 7. During the land-warfare phase of training, the students are flown out to San Clemente Island near San Diego. The waters off San Clemente are a breeding ground for great white sharks. To pass SEAL training, there are a series of long swims that must be completed. One is the night swim. Before the swim, the instructors joyfully brief the trainees on all the species of sharks that inhabit the waters off San Clemente. The instructors assure you, however, that no student has ever been eaten by a shark—at least not recently. But, you are also taught that if a shark begins to circle your position, stand your ground. Do not swim away. Do not act afraid. And if the shark, hungry for a midnight snack, darts towards you, then summon up all your strength and punch him in the snout and he will turn and swim away. So, if you want to change the world, don’t back down from the sharks. 8. As Navy SEALs, one of our jobs is to conduct underwater attacks against enemy shipping. We practiced this technique extensively during basic training. The ship-attack mission is where a pair of SEAL divers is dropped off outside an enemy harbor and then swims well over 2 miles—underwater—using nothing but a depth gauge and a compass to get to their target. To be successful in your mission, you have to swim under the ship and find the keel—the centerline and the deepest part of the ship. This is your objective. But the keel is also the darkest part of the ship, where you cannot see your hand in front of your face, where the noise from the ship’s machinery is deafening and where it is easy to get disoriented and fail. Every SEAL knows that under the keel, at the darkest moment of the mission, is the time when you must be calm, composed—when all your tactical skills, your physical power and all your inner strength must be brought to bear. 9. The ninth week of SEAL training is referred to as Hell Week. It is six days of no sleep, constant physical and mental harassment and one special day at the Mud Flats. The Mud Flats are an area between San Diego and Tijuana where the water runs off and creates the Tijuana slues—a swampy patch of terrain where the mud will engulf you. It is on Wednesday of Hell Week that you paddle down to the mud flats and spend the next 15 hours trying to survive the freezing-cold mud, the howling wind and the incessant pressure from the instructors to quit. As the sun began to set that Wednesday evening, my training class, having committed some “egregious infraction of the rules” was ordered into the mud. The mud consumed each man till there was nothing visible but our heads. The instructors told us we could leave the mud if only five men would quit—just five men and we could get out of the oppressive cold. Looking around the mud flat, it was apparent that some students were about to give up. It was still over eight hours till the sun came up—eight more hours of bone-chilling cold. The chattering teeth and shivering moans of the trainees were so loud it was hard to hear anything. And then, one voice began to echo through the night—one voice raised in song. The song was terribly out of tune, but sung with great enthusiasm. One voice became two, and two became three, and before long everyone in the class was singing. We knew that if one man could rise above the misery then others could as well. The instructors threatened us with more time in the mud if we kept up the singing—but the singing persisted. And somehow, the mud seemed a little warmer, the wind a little tamer and the dawn not so far away. If I have learned anything in my time traveling the world, it is the power of hope. The power of one person—Washington, Lincoln, King, Mandela and even a young girl from Pakistan named Malala—can change the world by giving people hope. So, if you want to change the world, start singing when you’re up to your neck in mud. 10. Finally, in SEAL training there is a bell. A brass bell that hangs in the center of the compound for all the students to see. All you have to do to quit is ring the bell. Ring the bell and you no longer have to wake up at 5 o’clock. Ring the bell and you no longer have to do the freezing cold swims. Ring the bell and you no longer have to do the runs, the obstacle course, the PT—and you no longer have to endure the hardships of training. Just ring the bell. To the graduating class of 2014, you are moments away from graduating. Moments away from beginning your journey through life. Moments away from starting to change the world—for the better. But start each day with a task completed. Find someone to help you through life. Respect everyone. Know that life is not fair and that you will fail often, but if you take some risks, step up when the times are toughest, face down the bullies, lift up the downtrodden and never, ever give up—if you do these things, then the next generation and the generations that follow will live in a world far better than the one we have today. And what started here will indeed have changed the world, for the better. Thank you very much. Hook ’em horns.